A local Christmas card delivery service ran during the month of December. Post boxes for cards were placed in various shops throughout the village as well as in the Church. The total sum of £391.23 was raised. The service of 9 Lessons & Carols took place in Fountain Road Church Hall on Sunday 7 December at 7.30 pm. Our friends from the Free Church came along to join us, some taking part in the traditional readings along with members from our own church. The hall had been decorated by volunteers the previous day with a beautifully decorated tree and Christmas lights around the hall. Following the service was followed by the usual teas with Christmas cake, mince pies and shortbread, the small hall also having been decorated for the event. The decorations will remain up for use by other groups using the hall between now and Christmas day. The retiring collection on the night was for our friends in India Village Ministries with whom our church has a close connection. The sum of £215.50 was raised for the children in the Orphanage and other ministries run by them. Our annual outing to the Panto took place on Tuesday 2 December. Twenty one of us attended a lovely evening of entertainment and fun. There were the usual sweeties on the bus, the ice cream in the break and the stop at the chippie on the way home. This year was our chance to see Aladdin. The costumes were amazing and some of Widow Twankey's outfits hilarious in design. 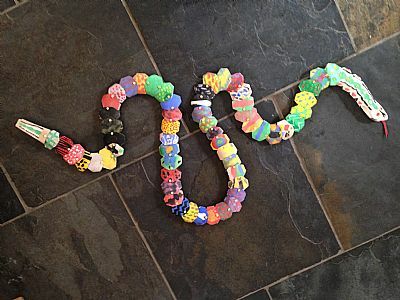 The audience, a lot of whom were groups of children, completely supported Wishy Washy and we all agreed he was very dishy. Everyone booed the evil Abanazer when he appeared to steal the princess. Our friendly coach driver picked us up in Golspie and returned us safely there so that we were home before the clock struck midnight. The Sunday Club on 5 October was a storming success! 28 children - our best yet - the project seems blessed so far. Thanks to all those who have given us their prayer support. It was encouraging to have Connor Mackay & Lisa Francis along to help with the younger children as part of their work towards their Saltire Award. Special thanks too to Stuart Gardiner for coming to introduce and help us with the Blythswood Shoe Box Appeal. Also Julia for collecting such a great amount of donations to start filling the boxes. All the boxes and the donations have gone to the church for members of the congregation to use when filling their own boxes. The Harvest Thanksgiving service was held on Sunday 28 September in Fountain Road Church Hall, and a group from the congregation had helped to decorate the Hall on the Saturday afternoon. 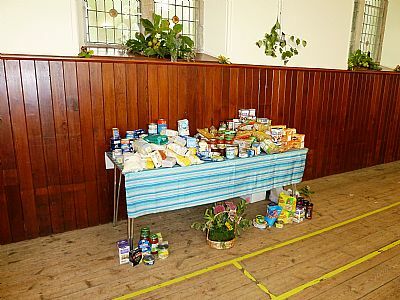 St Andrew’s Church had been asked once again to participate in the Blythswood Highland Foodbank Appeal. Our congregation has been asked to contribute Jars of Pasta Sauce, Tinned Ham, Tinned Fish, Rice, Crackers/Oatcakes in particular, although any donations of food were welcomed. The congregation responded generously to the appeal and had also asked friends and work colleagues to contribute. Thank you to everyone who participated in this appeal. The continuation of the work of the Highland Foodbank is totally dependent upon the generosity of the public. 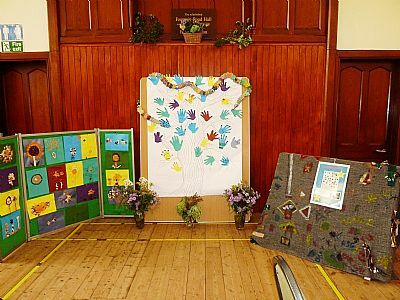 This photo shows the Arts & Crafts made by the children at the Sunday Club over the last six months which were displayed at the Harvest Thanksgiving Service. As part of the Stage 2 Complaints procedure the Highland Council have to have a meeting with the Complainer to discuss their complaint. Any Complainer who has taken their complaint to Stage 2 will be asked by the Council to agree to meet to discuss their complaint. Should anyone wish support during this meeting with the Council please contact Hugh Johnston or Patrick Argyle. "For anyone not satisfied with 'the grass bank solution for the disabled' there are pro-forma letters available to take your complaint to the Ombudsman." Hear ye! Hear ye! This Church is undertaking a campaign to pressurise The Highland Council to carry through their responsibilities with regard to putting in place disabled access to St Andrew’s Churchyard. If you are or if anyone you know is having difficulty accessing the Churchyard, whether a member or adherent of this church or not, please be encouraged to sign and send one of the pro forma letters. These are available from the Church book board or by contacting Hugh Johnston or Patrick Argyle. A successful Fete was held on Saturday 16 August in Fountain Road Church Hall and raised the magnificent sum of £1,500. Teas were served with delicious home-made pancakes hot off the girdle. A successful play scheme was held in Fountain Road Hall from Mon 7 July and ran from Mon - Wed 10:00am - 12:00pm for three weeks (through the week of 21 July). Games, crafts, stories, snacks - for ages 5-12 to come along and learn about God and have fun! Anyone under 5 had to be accompanied by an adult. 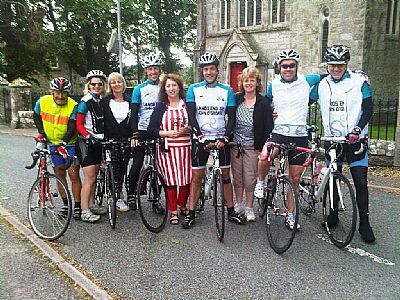 Almost every year a group of cyclists from the Bishop Simeon Trust take part in an "End to End" cycle from Land's End to John o' Groats, "The Race Against Time". The Tour De France has nothing on the TRAT 2014 cyclists as they cycled over 874 miles in only 6 days from Lands End to John O Groats. These are everyday cyclists who have a passion for making a difference. Making a difference for themselves, their own personal ambitions and those children in South Africa who are denied some of the most basic of needs and chances in life. Fountain Road Hall is the last stopping point on their way north and members of the congregation supply puddings for the group. By the time they reach Golspie they have been cycling for 6 days and are feeling very tired. The sun was shining as the group of cyclists arrived at Fountain Road Hall, the cyclists who had completed TRAT before were excitedly awaiting their last pit stop at Golspie as they knew what was awaiting them there! So just after lunch on day six, the cyclist arrived at Golspie. 7 puddings + 6 hungry cyclists = not many left overs! A t around 7.20 pm the TRAT cyclists made it to the end. Over 874 miles in 6 days. 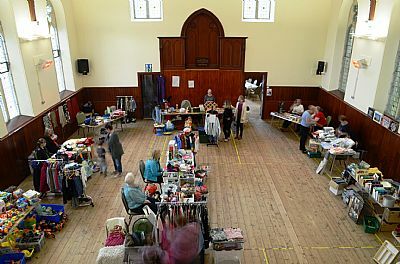 An indoor car boot sale was held in Fountain Road Hall on Saturday 28 June from 10am to 2 pm to raise funds for the Sunday Club and the Summer Play Scheme. A total of eleven tables were booked with a variety of goods for sale. 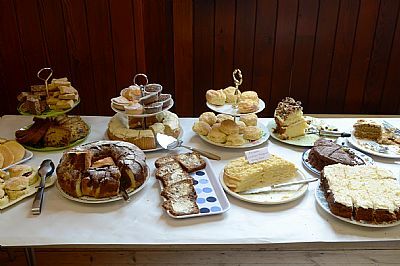 Teas, coffee and delicious home baking was available in the small hall as you can see from the photo. The total sum raised from the day’s event was £225 which was divided equally between the two groups. A good day was enjoyed by everyone who attended. The Sunday Club is held on the first Sunday of each month in Fountain Road Hall from 10am - 11.30am. Games, crafts, stories, snacks with something for everyone ages 5 - 12. Anyone under 5 must be accompanied by an adult. The Summer Play Scheme began on 7 July and will run on Mon - Wed 10:00am - 12:00pm for three weeks to Wed 23 July. Games, crafts, stories, snacks - if you are ages 5-12 come along and learn about God and have fun! Bring a friend! Anyone under 5 must be accompanied by an adult. 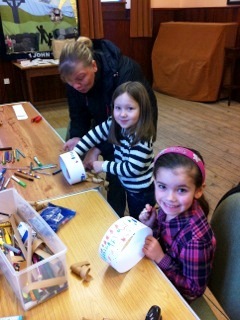 Photographs of the children's handiwork at the Sunday Club held on 4 May. 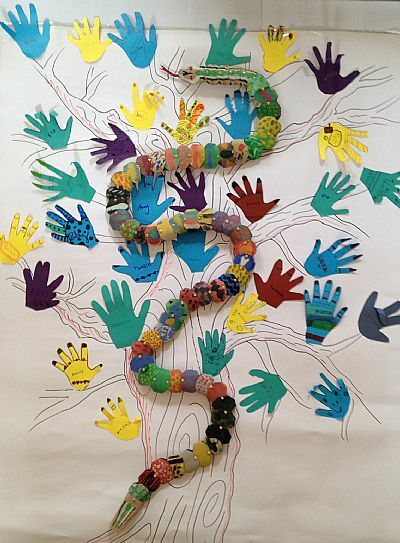 The tree was made in April as a representation of 'everyone has a part to play' and us all being different but important parts of the body of the Church. The same tree was also used to represent the Tree of Life in the Garden of Eden and the serpent was made in May when we looked at Adam and Eve and the temptation. The initial concept was to hold a non-denominational monthly Sunday activity session for primary school aged children to get together with family and friends to learn about Christianity. Sunday Club started in February with 10 children and has gradually increased in size since then and has covered the following topics. February - Samson and Delilah; 'finding strength we didn't know we had'; God will give you the strength you need when you need it. March - Joshua and the Battle of Jericho; 'following instructions to work smart, not hard''; do things the right way (i.e. God's way) and it works much better! April - The Cat that Walked by Himself (Rudyard Kipling); 'everyone has a part to play'; even the cat had a purpose (although he would not see it like that); we are all part of the body of Christ. May - Adam and Eve and the temptation and Hilaire Belloc's Matilda; 'always tell the truth'; the wages of sin is death; wrongdoing has consequences; we can ask God for help to resist temptation. June - Joseph and the coat of many colours; 'do as you would be done by'; forgiveness. July - potted sports/games session to bring all the previous sessions together on theme of Commonwealth Games. Summer Play Scheme will start the following week. A BRIGHT START TO EASTER IN THE BIBILICAL GARDEN. 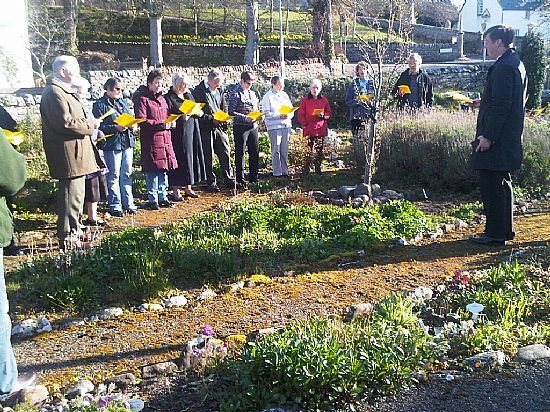 An open-air Easter Sunday service was held in the Biblical Garden at 8.30 am. The sun was out to greet everyone and passers by were able to join in the hymns, ‘Thine be the Glory’ and ‘What a friend we have in Jesus’. Everyone was invited back to Fountain Road Hall where breakfast was served. Enjoying breakfast before Easter Communion. The Sunday Club is held on the 1st Sunday of each month in Fountain Road Church Hall 10am - 11:30am. Fun, Friends and Free!! For ages 5 - 12 yrs. Games, singing, crafts and story-telling with refreshments. No need to book - just turn up. For further details contact Henrietta Marriott on 01408 634061 or 07740090799. The first day of Sunday Club was a great success! 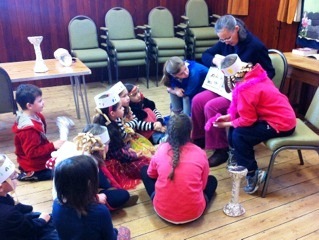 It was attended by 10 children who enjoyed crafts, games, prayer, a snack and a story from the Bible about Samson and Delilah. We are very encouraged by such a successful kick-off to this new venture in our church. Many thanks go to Henrietta, the Sunday Club leader, and to the other adults from our church family who came along to help. A new Bible Study started again on Wednesday 19th February and is based on a study of The Apostles’ Creed using the Study Guide I believe by Tim Chester. The Bible Study is open to anyone and you are invited to pick up a flier for this course from the Book Board in the Church or contact Stuart Gardiner at stuart.gardiner3@btinternet.com so that a copy of the Study Guide can be ordered for you. 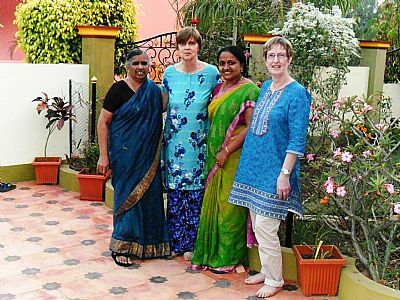 Our minister, Rev John Sterrett along with Session Clerk Isobel Murray and Elder Juna Sutherland zoomed off to India for two weeks on the 3rd of January this year to visit India Village Ministries (IVM) for a second time. John preached in six churches during the first week. The team of three, along with their hosts, Suresh and Roja Vemulapalli, had the privilege of visiting very rural villages in the south east of India - places most westerners would certainly never see. As well as visiting and preaching in churches and being fed by the congregations, John, Isobel and Juna also visited the sewing training centre for young women and observed the distribution of monthly aid to the elderly and infirm. Both of these are initiatives of IVM. They also enjoyed visits to the IVM Children's Home and had lunch with the children there. 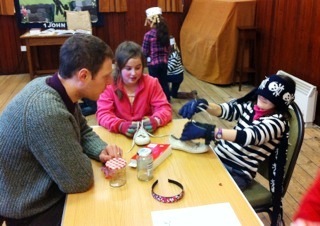 Many of the children remembered the Golspie trio from their last visit. The team discovered much more about IVM during this trip and learned what varied and effective ministries it oversees. The money sent by members of St Andrew's Church and others is truly well spent - meeting the needs of the people of rural villages in south eastern India. During the second week of their trip, the team visited Calcutta and toured the mother house of the Missionaries of Charity, Mother Theresa's famous order. They were privileged to pay a short visit to the orphanage there and stand in rooms filled with what seemed like 30-50 cots, each occupied by a three to six month old baby. Another similar room with cots was filled with new-borns. The team ended their journey with an interesting visit to the city of Hyderabad where they ate more curry, navigated their way through the crowded, old market and did some relaxing in the sunshine before flying back to chilly Scotland. They each felt they were highly privileged, on their second visit to India, to get in amongst the people more and to get closer to God, who is obviously doing such wonderful things in India and all over the world.